Il team di Calligra ha rilasciato oggi Calligra 2.6 Alpha. 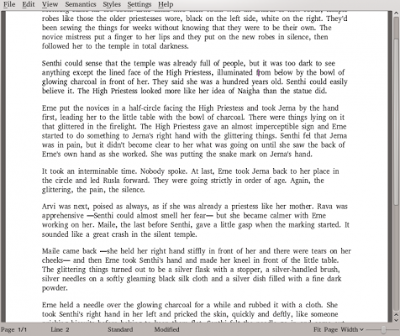 Questa nuova versione della suite da ufficio per KDE viene rilasciata con il tanto atteso nuovo programma Calligra Author, programma di cui vi ho parlato qualche tempo fa e che è indirizzato a tutti gli autori di ebook. Screenshot di Calligra Author nella modalità "Distraction Free Mode"
Calligra Author, the application will support a writer in the process of creating an eBook from concept to publication. Sheets, the spreadsheet application, has a new function optimizer – also known as a Solver – and all standard scripts are now localizable. Stage, the presentation program, has a new animation framework that lets the user create and manipulate animations in slideshows. Flow, the diagram application, has improved connections. Kexi, the database application, has new support for user data storage, in improved CSV import and export and improved table views. Krita, the drawing application, has new support for OpenColorIO, which makes it suitable for use in the movie industry. It also has big speedups in many places, including the vc library and when painting using the new precision slider in the preset editor. There is also improvements in painting HDR images and integration into a GFX workflow as well as support for the latest OpenRaster standard and many bugfixes. 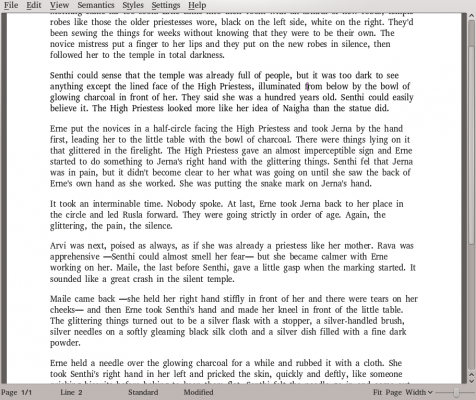 A new export filter for EPUB2 files. A new export filter for MOBI. MS Office have been improved even more, especially for the OOXML formats used in MS Office 2007 and 2010. Charts have a number of improvements for fine tuning the formatting. Examples include fonts for titles and labels and markers for datasets. Mathematical formulas have an improved rendering. Calligra Active, the version for tablets and smartphones, has several improvements: there is a new slide chooser for presentations, slides can be changed by flicking the device, page switching improvements for text documents and improved start up sequences including a new splash screen. Calligra Active also takes advantage of the improvements in the common parts of Calligra: the libraries and plugins. Maggiori info su come installare Calligra 2.6 Alpha sulla vostra distro le potete trovare in questa pagina.